Hackers & Designers founder Anja Groten interviewed Joana Chicau for an upcoming publication reflecting on our activities in 2017; in particular, we consider the learnings and questions raised during the investigation of processes of going on and off the grid. Joana Chicau will present a performance during the launch of the publication in Amsterdam on May 30th at San Seriffe. Anja: Thank you so much Joana for joining this conversation. Could you introduce yourself and your practice? Joana: My name is Joana Chicau, I'm a media designer. I've been doing a lot of work with web coding and programming web environments. In parallel, I run a project that investigates different choreographic genres. I try to combine these two worlds and see how one can inform the other, to see how they can be complementary. I started merging the languages of choreography and coding in live coding performances during my master’s studies at Piet Zwart Institute in Rotterdam from 2014-2016. These performances continue now still, but there have been other things that I've become interested in doing. Not just me on stage, but thinking about how choreography and coding together can serve other purposes, other people, other practices, and other forms of discussions. That's how the workshops eventually began and how you and I met in Amsterdam, Anja, with Klasien and the Why Not during first *The Body &. The Body & < >* at Lava Lab in June. Anja: What do you mean when you say choreography? You talk about it in different ways. I read somewhere that you thought about it as claiming back the choreography of interfaces. Joana: My point of departure is choreography in the sense of writing movement and understanding the movement of the body. But, of course, that also gets appropriated to different kinds of contexts. Especially now, as people question what physicality and owning the body means. Eventually, the definition of choreography becomes less strict to the dance world and to the physical world as well. Anja: You're talking about merging disciplines but also spaces: the browser and your physical body. What is the role of chance or events in these situations? Joana: Even though I write my own scripts – and there's a lot I write beforehand – it's actually being built while I'm investigating a specific choreographic genre. For example, post-modern dance was the first that I dove into. In that moment, I started to understand the choreographic language and I started to merge that with web coding. This mixture created this sort of double syntax, where we have very simple web actions that are actually influenced by choreographic discourse. This can be in the layer of meaning and in the layer of methodology. Really understanding the kind of parameters I want to use. It can be more theoretical or more pragmatic. Questions start to rise too, like what it means to relate to web environments. How much of these structures can be fixed and how much of these structures are responses to very extemporary circumstances. I work a lot with improvisation. 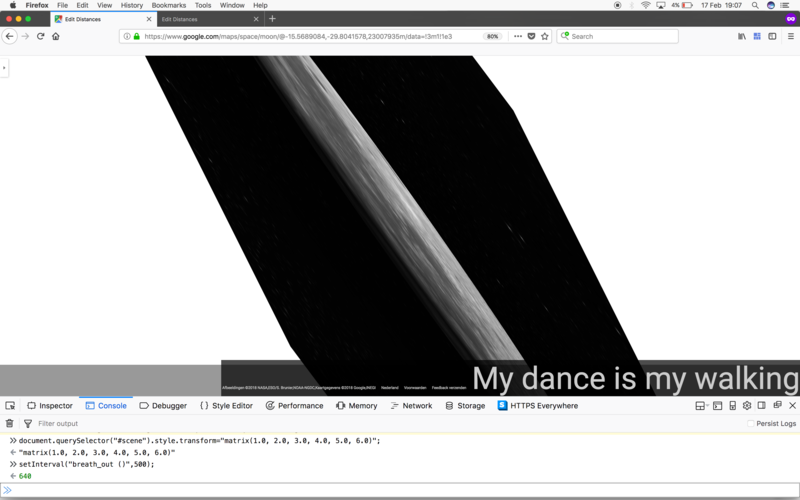 It's an interest I have had for a long time in dance performance and it is also something that I use during live coding. I'm not improvising 100%, but because I'm working in existing online platforms such as the Google Search engine, there are a lot of improvisational skills required. I can't rely on Google's structure because it changes, so there is always a sense of contingency and unpredictability that is present everytime I perform a piece. After I've been working with these languages for a while and get comfortable with them, though, it becomes the challenge to engage in a different path. I don't have a very linear sequence of actions. Something can lead to something completely different, so the audience never sees the exact same piece again. Anja: How does it make you feel? Do you have a background in improvisation specifically? Joana: I have a background in classical ballet and in contemporary dance. Improvisation is quite common in both. Contact improvisation is something that I often do in workshops to think of ways of improvising, or using chance operations, for instance, in a group exercise. I parallel this with using randomness when I live code. If you set certain functions to be random then you're allowing the algorithm to choose for you within a set of parameters. Not everything is random, but you're allowing certain aspects of the performance to act randomly. Anja: I've seen the possibility of failure in your performances before. When I see an error in my own work, I usually panic. But, is that kind of contingency still in the realm of what you can control and deal with? Or, do you also sometimes deal with trying to fix bugs? Is this a thrill for you? Joana: There are two things. One has to do with agency. If I set certain actions be random, then that is me acknowledging this randomness and it is the intentional base for a section of the performance. There are other moments, though, in which things can happen, like how you're saying: an error occurs, something fails. Many things that are not under my control or power can happen, and this is either because Google's interface changed a tag or something in the code, or because the internet fails or something crashes in my computer. That interferes a lot with how the audience experiences the performance, and it contrasts with how a show is typically delivered: neat and smooth, with no errors. The risk and the exposure of these contingencies are what I find quite powerful about performing live code. It is my decision that I am connected to the wifi and that I am using a web browser and Google as my stage. It's still within my agency and I've chosen for this agency to be shared. In this sharedness, there is a moment where we can see the idea of failure. In terms of web development, we always talk about bugs and solving issues, but for the users it doesn't always seem obvious. Even in terms of workflow and efficiency, it's interesting when technology is actually playing against you or when things don't flow in the same fast instant rhythm that we are used to. We can actually understand that it is a tool that is being developed. Both coding practices and the web environments are not static and they are not perfect. They are dynamic and it is actually in our hands to take part and contribute to its evolution and mutability. Anja: You talk a lot about interfaces when discussing your work. We are constantly surrounded by interfaces, scrolling, swiping, clicking, tagging. Even more so with the body and the interface, there is a new development of (e)motion tracking. By making use of our bodies as devices, are these interfaces starting to control us? Can your work be read as a critical commentary or an alternative proposal to this kind of phenomena happening in this interface society? Joana: It's funny you say that because I use computer vision in my last piece. The body becomes even more active. It's not just about typing - there are other forms of embodiment that interfere with the web and the environment. I would like to explore even more of that. In terms of corporeality, it matters how we face these machines. How do our relations become more or less controlled and controllable, more or less choreographed and choreograph-able? I understand that the lines are blurred between what it means to use an interface and the concept of interfacing. When I say the concept of interfacing, I mean how we engage with information and the systems behind it. The devices at stake go beyond the visual sphere to a myriad of other possible interactions. In the end, though, the most powerful structures remain. Our experience of the most common devices and interfaces don’t necessarily show the complex layers of the interests involved in the making of such systems. Each time I perform, I'm not really thinking of doing something aesthetically pleasing. I'm more interested in the risks, in the ritual of performing these kind of little challenges - of having to embed a code in an interface that has many layers to unveil. That's why sometimes my performances can be a bit tiresome for the audience. Anja: What role does the audience play in your work? Joana: The spectators are mainly witnesses or observers, not very active in the process. So far I like the tension of something that we are so accustomed to using turning into a spectacle - like a search tool, translation app, maps app. All these things that they always rely on, on tool usability, and then suddenly the tools become the center of a performance piece and it's about performing the tools instead. I like the tensions that arise from enacting the code in the tools and creating a different kind of narrative around them. It feels like pushing the people back from the technology, taking a step back. In the future I hope to develop different modes of engaging with the audience, and maybe the workshop formats have been a way to both share my methodology and involve people in the process. But, so far in the performance format, I like the fact that you can't really engage with these tools in the performance setting as in their normal everyday use. Anja: You move in between coding, design, dance; between sensations and knowledges. Do you feel like an expert on some levels, or an amateur on all levels? How do you deal with being part of multiple fields? If I zoom out, though, it feels like I'm touching every aspect of human living because it's about the internet and how we are related and how we behave with these network systems and how all our interests eventually collapse. So, I know very particular things, but at the same time I'm dealing with broad ideas. Of course, I'm not skilled at everything, which is also exciting. I can start conversation with people from various interests and fields and there's some kind of common knowledge that ties us together. Anja: Is there a clear distinction for you when the demonstration ends and the performance starts? Joana: In a performance, I feel different in my body and mindset. There's something that switches in how you have to behave as a performer. Demonstrations are usually smaller, and the way I talk about things may get wider or I may interrupt. They are two distinct formats. Anja: Where do you find your ideas for browser hacks in opposition to dance moves? When do you get ideas? When does it become a move and when does it become a hack? Joana: I don't feel that there's a pattern. I read a lot about how people have moved throughout history. I read about various choreographic perspectives. I take classes and I talk with choreographers. Eventually, there's always a moment in which something shines in my head and I really need to explore that concept and then I go to the browser and I see what that can mean in the web context. It can also be that I find a coding concept that resonates with something within the choreographic field and then it goes the other way, from code to choreography. It is very much about exploring and letting yourself be influenced by these languages and ways of seeing the world. Anja: You invest in free and open source software and in your choreographic work you use your own body. Is there a link to using what is available? What is the idea of using your own body? Joana: It all started very experimental. What I had available was me in front of the computer so it became very much a solo experiment. I first tried something beyond this at the Choreographic Coding Lab, which happened during Fiber last spring at the ICK Amsterdam. A group of dancers were present and we did an interesting experiment. This was possible because they had a rich and shared choreographic vocabulary and we decided to use some of my scripts in order to generate different associations for their shared vocabulary. Suddenly, there were all these dancers on stage responding to what they were looking at in the projection. It was intriguing, but it was a particular match because they had a focussed vocabulary that I could embed in my system. I didn't feel like I was imposing something on them. The fact that I'm interested in free and open source programming tools also means that people are invited to experiment with my coding system, in terms of embodiment and practice. Anja: Do you consider yourself a critical designer or maker? Do you think that critical design or making is possible using proprietary technology, namely softwares? Do you rely on tools that you don't have a lot of control over and that may govern your aesthetics? Joana: I've been trying to only use FLOSS tools, even for commission work. The latest I did was a visual identity for an event at V2_ Lab for the Unstable Media in Rotterdam. I used Inkscape and ImageMagick, for most digital material was fine, but for print it is more challenging. There are many compatibility issues when exporting the files and how those are read in different printers. In these matters, FLOSS feels harder than using Adobe. Designers can be critical in various ways. It can be in terms of tool sets they use or which clients they will or will not work with based on ethics, or because they decide to research contemporary topics. Everyone has their own focus. It's not easy to be critical in multiple ways in one's practice - using FLOSS, having a client aligned with one's value system, engaging only with research projects dealing with contemporary issues. This holistic approach is hard to find and hard to practice. I don't know if you have seen the pop up exhibition produced by Mozilla and curated by the Berlin-based NGO Tactical Tech in London last December. It was called *The Glass Room* and they had these case studies of different technologies and corporations. One case study were the Oyster cards, the cards you use for the subway in London. If you trace back and see who owns that company, it goes back to a war-related corporation - Cubic Corporation. The data from one of the city's most important public transportation is going to a corporation tied to warfare. It's so hard to imagine or even hard to trace back if you don't specifically pursue this information. This was just an example to show that even when you try your best to be ethical, or follow our own values, we will always miss things. I try to be coherent at every level. It's a learning process and it's about finding forces together with other people. Slowly building a community of people that is interested in FLOSS, starting to map the movement, understanding where we are in the world and making the effort to meet at a few events throughout the year. This is the best to manage, otherwise it just feels like a fight against the waves. Joana: I started doing a series live coding events where we openly discuss gender issues and inclusion in reference to coding and open technologies. It's about accessibility and a world that tries to not only respond to the commercial needs and commissions, but also how we can find alternative ways of expressing the use of these tools.